Nikon D90 vs. Canon EOS 50D vs…. With the bi-annual Photokina tradeshow just a month off, the camera announcements are starting to come fast and furious. We’ve had a whole slough of compact camera announcements from Sony, Olympus, Panasonic, Nikon, and Canon. And yesterday it started with the digital SLRs. Canon’s 15-megapixel EOS 50D (read more about the Canon EOS 50D) with a maximum ISO of 12800, caught me by surprise – especially since Canon users have all expecting a full-frame EOS 5D replacement. And rumors have been flying for a week or so about a Nikon DSLR announcement. Some leaked images and details on the new camera added some serious fuel to the Nikon fire. 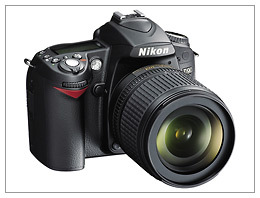 And today Nikon unveiled the 12.3-megapixel D90 – the first digital SLR to include full HD video capability. As the leaked info and name indicated, it’s a DX format (APS-C sensor size) step up from the 10-megapixel Nikon D80. The sensitivity range is ISO 200 to 3200 and can be expanded to ISO 100 on the low end and 6400 on the high end. The frame rate is a respectable 4.5 frames-per-second. It also includes Nikon’s Active D-Lighting in-camera processing, a sensor cleaning system, 11-point auto focus, a 3-inch 920k-resolution LCD display with Live View, and GPS compatibility. What really sets the Nikon D90 apart from other digital SLRs is the addition of the D-Movie mode. The D90 is the first digital SLR that can capture video as well as still images. It will record high-def video at 1280 x 720 pixels and 24 frames-per-second. With speed, high ISO performance, and the full range of changeable Nikkor lenses, the D90 could become the next big thing for homegrown action sports photographers. For more details and in-depth analysis of the Nikon D90 announcement, read the press release and check out deckcadet’s post on the Nikon Cameras Forum. I’ve been waiting around to see what this Canon 5D MKii (or whatever its called) will spec out to be. I really want to move into the Full Frame game, but now I want both the 5D MKII and the 50D! One for wide angle, one for 400mm zoom. But after the whole ordeal with the 1Ds-MIII I think I’ll wait and make sure everything is safe first. I don’t see wide-angle being a problem for APS-C sensor cameras anymore. There are lots of great super-wide lenses available for APS-C digital SLRs. I’ve used Canon’s EF-S 10-22mm and the Tokina 12-24mm f/4 and they’re both very good lenses. In my opinion, the real strength of a full-frame camera is in the depth-of-field control. You’re never going to be able to get the same kind of limited depth-of-field with a crop-sensor camera that you can with the 5D, D3, or 1Ds Mark III. Image quality is an issue, too. A bigger sensor will always deliver better image quality. Although I’d argue that we’ve reached the point where image quality is good enough that better isn’t necessarily that important anymore. not for the average photography, anyway. I wanted to nicely disagree with your comment that, “the D90 could become the next big thing for homegrown action sports photographers.” By “homegrown” I assume you mean average joe, so prosumers only. If you want action shots then you want a high frames-per-second rate. Canon’s 40D or 50D have over 6 fps. The D90 doesn’t touch that. (None of Nikon’s prosumers touch that and if they do they are more expensive than the new 50D) If you meant video capture then you can get full HD (1080p not 720) at 30 fps from Aiptelk for $150 that also includes 60 fps at 720p. The D90 might be better with its expanded ISO but I would never suggest this camera to a budding sport photog. Even the Canon 20D does 5 fps. Nikon does have other high frame rate cams. Just not this one and not for under $1500 (relative I know if you count .. uh . . auction sites) I don’t look at this stuff for a living so I might be wrong. Please let me know if I am. Sorry if I sound “canonized” : ) Have fun catching photons or waves. Bri-Guy: Sure Canon might have few frames per second more, but then again the 50D cost more, we should see Nikon increase this with there Pro-consumer cameras, I think the Nikon D300 is more comparable to the 40D or 50D and once again it comes down to preference, because lets face it give any decent pro a good camera and they will likely take a decent shot. but it blows the competition away for what it can do… How about 60fps…. I am Canon/Nikon user but have used this camera for about a week now and I am constantly impressed for what it can do. Of course it isn’t in the same league to me as picture quality, but it sure isn’t bad. I would expect to see Nikon and Canon making cameras like this soon, but for a ton hellofa lot more money. Also this Casio can shoot in HD mode for much longer than the Nikon. Nikon D90 Vs. EOS 5D mark II, my choice the nikon D90. Compare the two, what do they offer over the other? The Nikon D90 for the price is much better, yes the Canon will deal with more rounded photography, bu in terms of HD video the D90 will make the canon movie mode look like a useless side function. How do you figure Jacob? The D90 only shoots 720 @ 24fps and the 5d MKII shoots 1080p @ 30fps. I don’t know about your eyes, but 1080p looks significantly better than 720p to me. In addition to 1080p vs 720p, the 5D is superior to the 90D in photography specs as such as ISO range, fps, and shutter speeds. Not to mention that the 5D is a full frame camera that is aimed at the pro’s. That’s where the extra cost lies. since when were we so concerned with these cameras taking video anyway….if you want to take video dont get a camera, get a camcorder. First, it actually is more useful that the 5D Mk. II’s mode for one reason: 24P. I’ve read lots of reviews that say it’s bad because it’s “not as smooth” as 30P. Guess they don’t know that filmmakers like me spend thousands of dollars for that “jerky” look. Hm. 24P over 30P is a GOOD thing, not a bad thing. Sure, you can switch 30P to 24P in post, but that adds another rendering process to it so you lose picture quality and most importantly, TIME. Also, keep in mind the movie mode isn’t marketed towards “budding home movie-makers.” Nor is it marketed towards professional filmmakers. Nor is it marketed towards photographers. Instead, it’s more for people like me who do both video and stills on low budgets. It’s all about feature/price/application. For my application and price range, the D90 is a clear winner over the Mark II. However, if I was mostly a photographer looking to add videoy looking video to my wedding package, and I wasn’t adverse to spending $4,000 over the $1,500 the D90 is, then perhaps I’d like the Mark II more. The real question is how much you are prepared to pay? If you have $2,500 – $3,000 to spend on a camera then go for the the Canon but for less than $1k you can get a great still with the bonus of video in the Nikon. Of course, if you have a large investment in lens and you don’t have a lot of spare cash you stick with your current brand. I purchased the D90 and love it. The video function is fine but don’t expect to shoot more than short segments. This shouldn’t be a problem since most pro or pro-am videos are shot in very short segments i.e. <30 seconds. If you want to shoot your kid’s 30 minute 6th grade band concert stick with a camcorder. D90 video only have fixed zoom. I think you forget to mention about it. Hi I am in the market for a new digital dlsr and the two i am torn with are the Nikon D90 and Canon 50D I am an amature photog, and mostly shoot family, wildlife, nature and kids sports. What do you suggest. After using both the Canon EOS 50D (I bought it) and the Nikon D90 (we have been testing one for review), I would go with the Nikon D90. If it’s all about image quality, it’s absolutely the best in the mid-range DSLR class right now. However, I always recommend dialing it back on the camera body and spending your money on lenses instead. They’re really more important than the camera. And there are no bad digital SLRs anymore. So if this is your first DSLR, take a look instead at the Nikon D60 and Canon XSi / 450D and better lenses than the kit lenses. I think that’s a better way to get started. And for what it’s worth, I own an XSi as well as the EOS 50D. I am just as happy to use the XSi as the 50D. Who in their right mind would let “video” capabilities enter into their decision to buy a DSLR? Buy a camcorder for goodness sake. I have a Canon Xsi, and a 50D, and love’em both. Canon and Nikon are always going to be neck-and-neck in the “better than” race. There doesn’t seem to be a nickels worth of difference in them. One of them will always have a small advantage “feature wise” over the other. Most things being comparable, I have to fall back sometimes on small things like…which one feels better in my hand, or which one is most “menu friendly”. If you try to buy a new camera everytime one of them gets an advantage over the other, you’ll be camera poor the rest of your life. P.S. to my note. Go ahead and shoot me, but for my 50D, I bought a Tamron 18×270 lens, and am amazed by it. Canon and Nikon build the lenses that they want us to have (so we will have to have more of them) and charge rediculous prices for them. Tamron and the after market lens manufacturers build the lenses that we want, with very high quality, and charge reasonable prices for them. Im an avid user of Nikon cameras and I find it very easy to use. The quality of the images is undeniably awesome. I never tried using a Canon DSLR before and Im tempted with the 50D’s specs. The downside of it is the price. im still confused and still dont know what to buy. Iam mostly a sports photographer and currently own a Canon 20D, 40D, and 50D. My son owns a 30D. I switched from Nikon a few years ago on advice from a pro football sports photographer. I saw sports shots taken with his fairly new Canon 5D Mark 2. He had his laptop at a college basketball game and showed a few of us sports photographers some of his cropped, enlarged close up shots. The faces that covered most of his cropped images were FANTASTIC !!! Sharpest I’ve ever seen. I guess the 21 megapixels makes a big difference when cropping and enlarging. The Canon 5D Mark 2 is for me ! As far as video is concerned, if you need to shoot both, get a small camcorder for about $300 and hang it around your neck. The video on a Nikon 90D is a gimmick to make you think you’re getting more than your money’s worth. Just another feature that may need repairs down the line. Why are you even comparing a Canon EOS 5D (full-frame, pro tool) to a Nikon D90 (semi-pro/hobbist tool)? I have owned 300D, 350D, and just purchased a 50D; along with a friend who purchased the D90 at the same time. Each of us will use both cameras and post our findings in a few months. Video people, like me, are always trying to get a film-look out of video. I think what makes the D90 interesting to me for video is it shoots HD with Nikon lenses and gives a more pro look (film-like depth of field) than even my Panasonic HVX-200 with its attached Leica lens system. It has its limitations, but for 720p stock footage, low-end commercials, and a little know-how, the D-90 will do just fine. I have shot a thousand or so commercials with my Panasonic and love its features, I just wish it was delivered with a Nikon lens mount and no lens. Investing another $2,000 for an adapter is silly, I simply open the aperture and adjust shutter speed/ND filters and/or back-up to get the depth of field the 35mm lens offers. at the end of the day, it’s the image result that speaks the loudest. So far as I know, Nikkors are slightly better lenses (not knowing about their quality compared to Canon L series, though), but Canon has better engine. Both are important. IMHO Canon has more neutral color tone (so was Minolta). The 50D has better body than the D90. To me, Nikon & Canon are like…Honda & Toyota. I collect Leicas, Hasselblads, Rolleis, and many more, so I know neither lenses come close to the sharpness & details of Leitz or Zeiss. Ive thrown everything into consideration but i still cant come up with a suitable outcome. what would you rather use in the case of art photography, and/or photojournalism D90 – 50D? or else? IMany photographer in my place use Nikon instead of Canon. My Canon friend start to change their camera to Nikon. In my point of view, for better grip, pro handling and manufacture quality, I choose Canon. But if compare to picture quality, Nikon was my first choice. There’s no much different between this two brand. For example, Canon EOS 50D has much better in MP and shot per second rather than Nikon D90. But Nikon has better features like LiveView, Video Record and GeoTag. Compare to picture quality, I would like to say, there not so much different at all. Nikon D90 has a lively looks in every spontaneous picture taken, some might jeopardize with white balance condition, but still among the best picture you can have. Canon EOS 50D has a more advance in color condition less blurry picture in one spontaneous picture taken. Canon EOS 50D has more product quality guarantee rather than Nikon D90. Yet still Nikon has better image quality rather than Canon. You guys are nit picking. A pupil of Ansel Adams that I know is a very successful professional photographer and shoots with a Canon 40D. That said, I recently chose the 50D over the Nikon D90 after months of debate and research. For me, It came down to the Nikon display model in the store having an error, and then researching the error and finding out that a lot of people were having this error and returning their D90′s. I liked the functionality of the canon and It takes amazing shots with the kit lense. I plan to get the 18-200mm and hope to have a great experience. Anyway, you really can’t go wrong with these cameras. It’s been quite a while since I wrote this article. I’ve used the D90, the EOS 50D and the EOS 40D in that time, I owned the 40D and the 50D and frankly, the 50D was a bit disappointing as an upgrade from the 40D. Don’t get me wrong – the 50D is a fine camera. But I didn’t think it was that much better than the 40D. In the end, I think the D90 is the better camera and I’ve been recommending it over the 50D for most photographers. The new Canon EOS 7D is another story. This camera I love and I was very happy to off my 50D and replace it with the 7D. I liked the balance in my hands a little more than the canons when I was initially checking the two makes out. I’m small in stature and I don’t have tons of money to spend on a camera that costs more than my car. I also liked that you can use many of the really old F mount lenses that used to go onto the old film Nikon SLRs. (I’m an oldster and probably one of the last die hards to make the jump from film to digital, so I have no real issues running the thing fully manually). Yes. I agree the video mode is kind of useless unless you have it on a really solid mount, but since I do photomicroscopy with it as well, the microscope on a sturdy table is adequate and the images are far higher quality than the old coolpix I used to use on the scope. I’m pretty happy with the still images I get with it too When photographing wildlife, I can run it at an iso of 640 and can get some respectable enlargements without a lot of noise. I’m waiting for the day somebody produces an camera that runs directly off my visual cortex. Then I won’t have to lug around anything. It is great to own a NikonD90 as is shoots perfect pictures and great!!! I am a canon user when i was 12 years old and until now i still use canon and every year i change my camera, honestly i compared with NIkon and canon are better in quality of pictures and Nikon can’t shoot night pictures as a canon. I have a 50D and it is a bit heay but it worth for it for the quality you get. use a USM lens and you get what you want with it. To take good pictures you need a good lens as well and the white lenses are the best. If you still want a camera with movie better buy camcorders and nowadays a great variety of Full HD are available in the market. 50D is a must if you are going to select between D90 and 50D. Everything depends on what you need and what your preferences are. As for me as an advance amateur photographer, I choice Canon EOS 50D over Nikon D90. Sure, both camera has it’s own advantage and disadvantages but like I said, depends on what your shooting. For me, I more on sports, wildlife, landscape and portraiture, weddings and big social events and the 50D meets my needs(I also have an EOS Mark IV bought it 1 weeks ago which is a different camera than an APS-C Camera for other photography use). Nikon D90 is a great camera but I don’t need the video capability features, slow fps and and lower MP compared to 50D 6.3 fps good enough for me for sports photography and the 15MP is more adequate. As for picture quality, I don’t see much difference between both camera body but I rather say, the quality of the picture depends on what lens you use. I tried both 50D and D90 before I decide which 1 to choice. I bought the body only with battery grip and an extra battery on each camera and bought the Canon EF 70-200mm f/2.8L IS USM II and AF-S Nikkor 70-200mm f/2.8G ED VR II Lens, test shot all week, as for picture quality(Same subject, ISO, Aperture, Shutter Speed, RAW,etc…), frankly, I don’t see a big difference, either both equal or one is better than the other(probably I need a new pair of glasses). I choice the 50D over D90 bec. of for me, it feels durable and comfortable with my hands, Faster FPS, slightly higher MP(no biggie), and Easier Menu and I DO NOT LIKE THE VIDEO FEATURES ON MY DSLR CAMERA(for other consumer of course the video is a plus, not for me. If I want to shoot video, then I will concentrate on Video Camera). For Canon 40D Users, yes, no big difference, it’s not an upgrade. That only if you have the 40D. This review are for those who are new to DSLR or switching from Film to Digital or a Canon EOS older Users. Not even a comparison to Canon 7D or 5D Mark II which is a different camera body as well as other higher or lower version of Nikon D90 or to prosumers decided to switch from other camera brand to Nikon or Canon. Invest for a good lens than the camera body that changes every few years but a good quality lens will last a life time. I am an amateur and chose the 7D by comparing specs of both the D90 and 50d cameras. I ABSOLUTELY LOVE IT!! I am not a photographer at all, but you can’t tell it from my picts. I was getting some of them developed at walmart the other day and the photo mgr had me sign a copyright release. It’s not me, it’s the camera. I just wish I knew how to properly use it. b4 tis i always use program.. Interesting thing is; Nikon D90 introduced the first movie mode in a DSLR. Subsequently, the supremacy was snatched away by Canon with outstanding movie options on their DSLRs. The 7D’s movie option is as good as high-end camcorders if not better than some of them. However, I agree DSLRs should be chosen on their capabilities as DSLRs – not movie shooters. 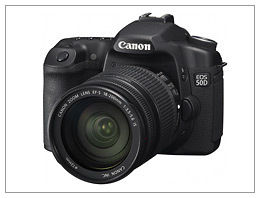 I am thinking of buying the canon 50d body,will my old slr lenses work with the 50d on autofocus? Hi everyone! I’m a semi-pro photographer and I want to buy a camera for fashion photos and portraits with a soft tuch. I was just wondering, wich one (nikon d90 or canon 50d) is a better choose?What camera impressed you? Thanks! I bought the Nikon D90 about a year ago. I have not touched the video…why? Because I didn’t buy a glorified camcorder, I bought a CAMERA. Looking back I would have not made a mistake had I bought the Canon 50d either. Both are good cameras and both will allow you to take great photos. I have to say though, if I could turn the clock back I may have rather gone for the Canon 50d due to the frame rate and the weather sealed body. All in all though it’s too close to call.